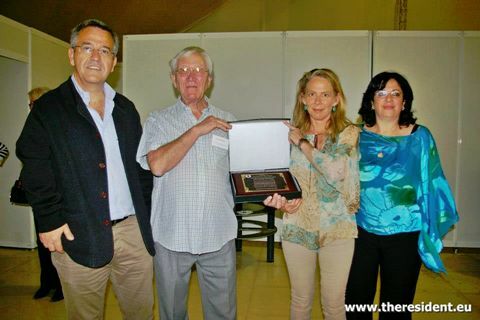 Ray Oldfield, Vice President and Secretary of Estepona’s Foreign Residents Association, AREME, was presented with the Resident of the Year award at this year’s Foreign Residents Day celebrations at the Palacio de Congresos in Estepona. Ray has been serving Estepona’s foreign community for many years now, most recently as Secretary of AREME, which draws together people from many different nationalities, communities, clubs and associations and which is also responsible for staging the Foreign Residents Day Festival which once again was a great success. AREME also holds regular information forums with invited guest speakers addressing issues affecting foreign residents, as well as regular coffee mornings and table sales.